Looking to upgrade your kitchen? 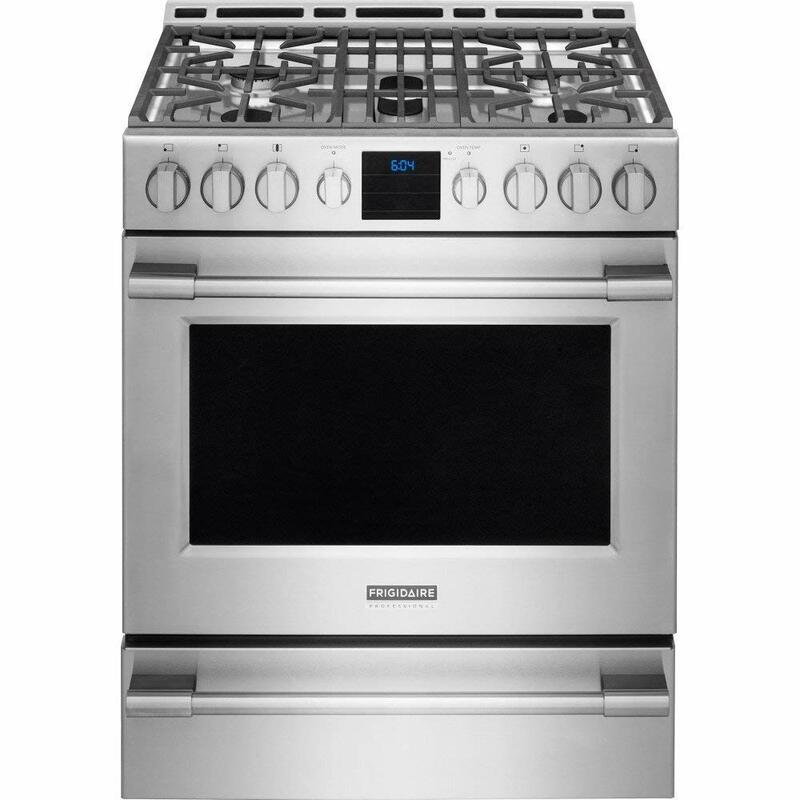 A gas range is the way to go, and the KitchenAid KSGG700Ess 30-inch may be just what you’re looking for. Your range is an integral part of your home. You use it almost daily. You anchor everything else in your kitchen around it. It’s a showpiece and a part of the family. Naturally, you want to choose your next range carefully. Because everyone’s needs are different, a gas range may not be what you’re looking for. I prefer gas ranges myself. When I was 20, I started an apprenticeship to be a chef. I loved cooking complicated dishes, and a "true cook" feels as they can only use a gas range. At 22, I left (I realized working in a kitchen was horrible) and enrolled in college. But my love for gas range cooking never faded. Also, I prefer quality gas ranges. The KitchenAid KSGG700Ess is one of those ranges that a one-time chef like me would love to cook on. But you don’t need to be a failed chef to enjoy having this range in your home. This is for everyone! How Does It The KitchenAid KSGG700ESS Compare? Until now, I’ve only discussed the specifications of the KSGG700ESS. What you and I really want to know is how well it performs in the real world. Do owners like it? Does it do what it’s supposed to? 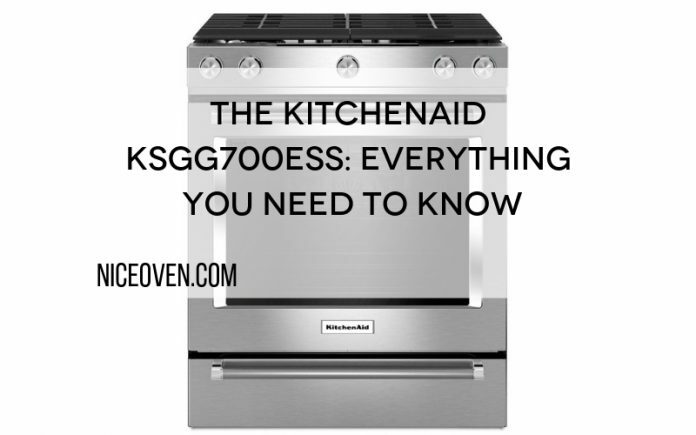 What do the experts say about the KSGG700ESS? For the answers, I turned to both Consumer Reports and Amazon customer reviews. I then compared the KSGG700ESS to several competitors to see how well it holds up against other brands. Because I trust the incredible reviewers at Consumer Reports, I went to see what they wrote about every gas range here. And because I trust reviews written by real people, I read through a lot of praise and complaints on Amazon. I was able to get a solid idea of how well all these ranges perform in the real world. Ranges are just one item in KitchenAid’s incredible inventory of products. They make blenders, mixers, cookware, refrigerators, dishwashers, and everything in between. The company has been around since World War 1. They started making standardized mixers for U.S. Navy battleships. When the war ended, the company switched to home products and KitchenAid was founded. Mixers were the company's bread and butter during the Roaring Twenties, but then the Dirty Thirties and then World War II came along. KitchenAid closed its doors for nearly twenty years and reopened when the war ended. The postwar boom saw KitchenAid grow to introduce refrigerators and ovens. Despite a fantastic history, Whirlpool now owns KitchenAid. Most of their products are still manufactured in the USA and Canada. Products entering the Asian markets are manufactured in China and South Korea. Although you can choose from a wide variety of KitchenAid ranges, the KSGG700Ess is one of the nicer ones. It is professional-grade, perfect for a wannabe chef like me. Its stainless-steel construction is made by hand, so all imperfections have been snuffed out. 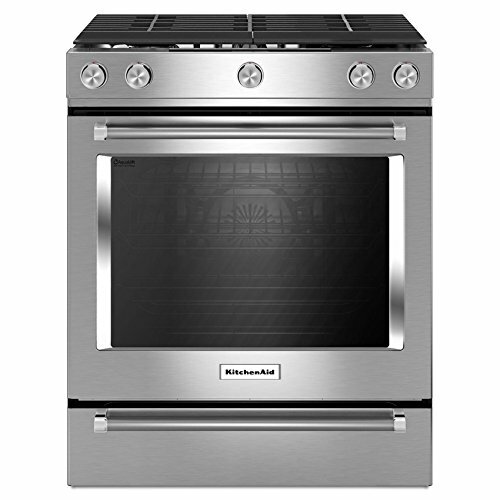 The range’s width is 30 inches, and the oven has a 5.8 cubic-foot capacity. Moreover, the convection oven has “Even-Heat” true convection capabilities. 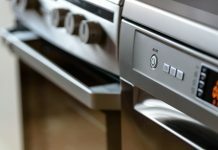 Basically, the oven is shaped like a large bowtie, and a powerful fan ensures heat remains consistent at all points throughout the cooking period. You can even add a bit of humidity to keep food from drying out. I didn’t have that function when I was training to be a chef! Then there is the stove on top. The KSGG700Ess comes with 5 gas burners which cook between 5,000 and 17,0000 BTUs. These burners are very precise, so you can keep a kettle on simmer or boil the heck out of a pot of lobster. The KitchenAid KSGG700ESS has different costs in different sellers. The cost variation depends on retailer and location. Because you’re investing so much money into such an important purchase, the warranty you purchase for the product is extremely important. I have a hard time trusting companies that skimp on warranty. If they can’t stand behind their products, why should I? Thankfully the KSGG700ESS is protected by KitchenAid’s standard 12-month no-questions-asked warranty. This protects your purchase against any manufacturer defects. KitchenAid also has service plans you can purchase which take over after the warranty expires. For as low as $35 a month, you can have your range repaired in-home with no deductible at any time. I like that option. In short, the KSGG700ESS has terrible reviews. Consumer Reports gave it 1.5 out of 5 stars. They loved its attractive design, large surface area, and powerful burners. They however mentioned that the oven was unreliable in its performance, and it was underpowered. The burners all heat at different temperatures and finding the right one for your pot was a guessing game. Amazon customers rated the KSGG700ESS 1.0 out of 5 stars. They really were not impressed! Some people complained that the oven doesn’t vent properly. Heat builds up, and the entire surface becomes too hot to touch. Others complained that the knobs were loose and unsafe. The KSGG700ESS didn’t receive very high ratings. It was the worst-rated gas range out of all of the models reviewed. However, that doesn’t mean it’s all bad. There is a lot to like about this KitchenAid range despite its flaws. First up in our comparison is Kenmore. They’ve been making appliances since 1919, as long as KitchenAid. Technically Kenmore is owned by Sears, although it operates as its own brand. Most of its manufacturing is done in the U.S., Canada, and Mexico. 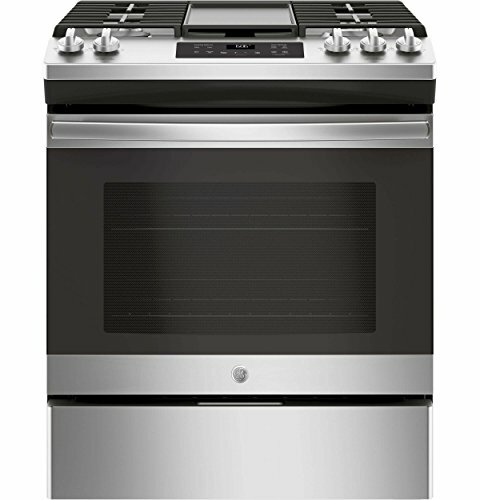 The 73433 (and the 73432) is a stainless-steel 30-inch gas range. It has four burners instead of five, but everything else is comparable to the KSGG700ESS. A powerful convection oven cooks pretty much anything you can throw in there. It doesn’t have that cool moisture-adding function which the KSGG700ESS has. It comes with Kenmore’s impressive 5-year limited warranty. Although it seems like almost the same oven, the Kenmore has terrific reviews. Consumer Reports rated it 5 out of 5 stars, a rare achievement for any product. Customers on Amazon rated it 4.2 out of 5 stars. People loved how powerful and reliable the burners were. It cleans super easy and looks great too. A couple of people mentioned that it’s a little larger than 30-inches and was hard to fit into their kitchen. 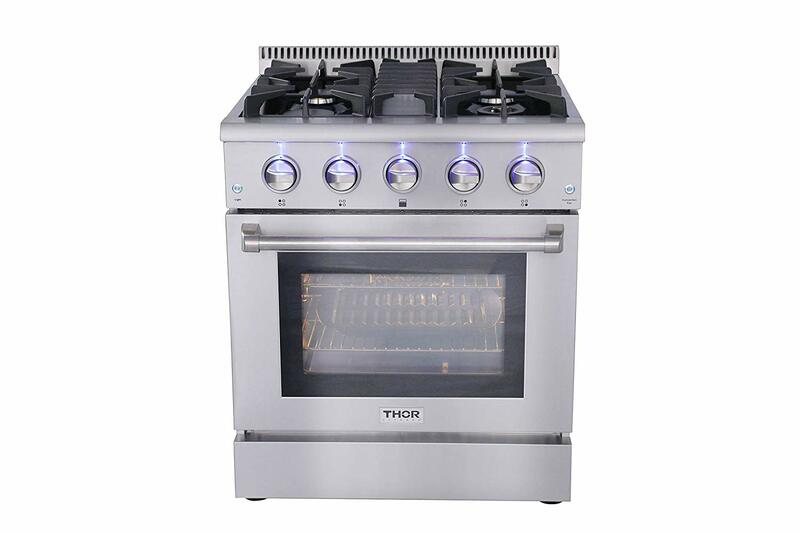 Next up we have a gas range from Thor Kitchen. This California-based company burst onto the scene offering consumers a professional-grade stainless steel kitchen. This company makes bold appliances, and they don’t hold back. Personally, I love the idea! 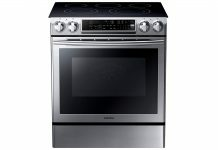 The Thor Kitchen freestanding gas range is the same five-burner, 30-inch width, convection-oven as the KitchenAid KSGG700ESS. It includes black porcelain stove covers and oven racks. Additionally, it comes with an unlimited 2-year warranty. Thor Kitchen will replace any parts free of charge. Because this range has no electronics, reviewers found it very reliable. Consumer Reports gave it 3 out of 5 stars. It lost two stars because they found the burners didn’t maintain heating consistency. Customers on Amazon felt differently, rating it 4.2 out of 5 stars. Most people said that the burners and the convection oven heat up fast. Things get cooked. It does its job and looks beautiful, too. Third on our list is the JGSS66SELSS by General Electric. GE has been making appliances since 1889. It was one of Thomas Edison’s many business ventures. Although the great inventor became bored with the company months after founding it, his partners continued on. Today GE is one of the largest manufacturers of appliances in the world. Now on to the JGSS66SELSS. This range looks sleek and modern. The cooktop goes edge-to-edge. It’s like a mix between a gas range and a flat top range, which I’ve never seen before. It has five surface burners with a cast-iron grate. The convection oven can inject moisture into it just like the KSGG700ESS. This oven can also steam-clean itself. That means no burning smell during self-cleaning. Moreover, it comes with a comprehensive 5-year warranty. Consumer Reports hasn’t rated this model yet, but customers on Amazon gave it 4.6 out of 5 stars. Everyone said the product works amazingly well. The heat is consistent. Most people loved the sleek modern design. Someone did mention that if you need to adjust the size, you have to pay extra. You can’t please everyone. 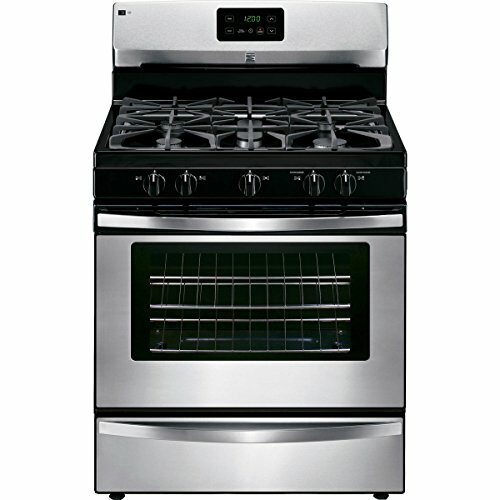 Finally, we have the Frigidaire Professional 30-inch freestanding gas range. That’s a mouthful, but I don’t make the names of these things. Frigidaire was once an American company from Fort Wayne, Indiana. It was bought by European Electrolux in 1979 and has been a German company ever since. The 30-inch gas range is “professional quality.” As a one-time professional cook, I have doubts. It has five burners, just like the KSGG700ESS. It also includes a patented "PowerPlus" temperature probe and QuickStart system. The oven is ready to go within minutes. Stick the probe in your roast, and the oven will keep adjusting temperatures to ensure an even and perfect cook. This takes the fun out of squishing the meat with a fork and guessing, but it’s more accurate. Despite the cool technology, Consumer Reports wasn’t happy with this model. They rated it 1 star out of 5. Ironically, they found the oven imprecise and the temperature controls were unreliable. Amazon customers weren’t too thrilled, either. It received 3.3 out of 5 stars. People said the range looks really nice, but there were many complaints that the electronics were not precise. There’s also a large recess at the rear which means the range can’t line up flush with the wall. If you’re like me, you tend to look at all your options before making a purchase. You want to invest in a gas range that will be a part of your home for years. The KitchenAid KSGG700ESS is a beautiful professional-grade cooker, but it has terrible reviews from both professionals and owners alike. So what else is there to choose from? Like I mentioned at the beginning of this review, I’m a one-time semi-trained chef. I spent just over two years as an apprentice in a fast-paced fine dining restaurant kitchen. I’m not an expert in gas ranges, but I do have a pretty good idea of what to look for in a gas range. I also make a mean bruschetta. That being said, the KitchenAid KSGG700ESS has so much potential. Unfortunately, KitchenAid dropped the ball on some major functionality with this model. Having consistent heat is so important. I also don’t like this trend of making different burners pump out different BTU’s. But a lot of range makers are doing that these days. That’s what the temperature control knobs are for. All in all, I wouldn’t suggest sinking your money into this range. 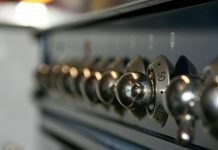 The Thor Kitchen is by far my favorite gas range on this list, but if you don’t want to spend a lot of money, you can pick up a Kenmore for half the price. This was the highest-rated range on this list, from both Consumer Reports and Amazon customers. It gives you the best bang for your buck, and it looks nice, too! Next articleThe Samsung NX58F5500SS Oven: Is It The Right Oven For You?